Forum Index > Historical Arms Talk > Cusped and cleaver falchions. Posted: Sat 30 Sep, 2017 8:07 am Post subject: Cusped and cleaver falchions. So, everyone loves falchions? Right? But what was the main advantages and disadvantages with each? Obviously cusped falchions, with more acute points, would be able to thrust a lot better. But what were the advantages of a cleaver falchion? This is what I'm not so sure about. They appear to have more weight on the end of the blade, adding a bit more heft... But is that really an advantage? Are they actually heavier or do they just appear to be? I've never held a falchion of either type, so I'm asking for a bit of help from the more experienced members of the community here. I speculate that the cleaver falchions would also have been cheaper and easier to make and produce... Would I be correct in saying this? And, lastly, what do you all perfer? Personally I like the cussed falchion more, as it looks a lot better in my opinion, and I like that it is at least slightly useful for thrusting purposes. Thank you for reading, I would love to hear your opinions on the subject. I'm thinking of getting my self a falchion. If I'm honest it's my favourite sword design both for looks and practicality. Both types usually have drastic distal taper in the top part and both bowie and cleaver shapes don't have too much weight in the top part. Both are thin slicers in the CoP area. But what would be the purpose of the cleaver version? It gains cutter-Bility, but looses thrusting capability? It is unfortunate that there is a large misconception about falchions being machetes when they rarely exceeded 2-3 pounds. Actually, looking at the historical pieces, the "cleaver" falchions seem not to be heavier than the "cusped" ones. In fact the weight are quite similar in proportions. I'm not sure that the balance point was farther to the guard on these falchions as well. The blade shape is not the same between these two types, but there is another dramatic difference: the distal taper. I understood (from different sources, the main one beeing James Elmslie's works) that, on the cusped ones, the distal taper is quite similar (but more important) to the swords, but on the cleaver ones it is much more important. In fact, the blade on the widest part (i.e. center of percussion) is extremely thin, like 1,5mm only. It seems logic, as the cusped one, being able to decently thrust, needs a stiff blade, and the cleaver one being highly specialized in cutting, it has a greater need for a flexible blade. There is a theory for this design's creation: it may have been used for cutting through padded and textile armors (gambisons and such). - The vast majority of them were pretty light. - They were made by experienced swordsmiths (falchionsmiths?) as their blade geometry is actually more complicated that we could think at just looking at some pictures. I guess that if James Elmslie comes here he would be able to give you a better answer than me. I have in my small collection a two-handed falchion with a cusped blade, made by Marco Danelli. It may be a sort of fantasy design anyway, as we have no historical example of a "real" two-handed falchion... but we made it according to some french 15th century illuminations, and using the famous Thorpe falchion as an inspiration for the blade shape and size. I'm waiting for another cusped one (this time "inverted", as the clip point in on the main edge and not on the back) by Maciej Kopciuch, that is actually finished now and is very closely replicating the Invalides one. I'm eager to get it! I think you've pretty much got the " cusped " point nailed. They feel extremely lively, to the point it almost shocked me when I first held a properly made one. 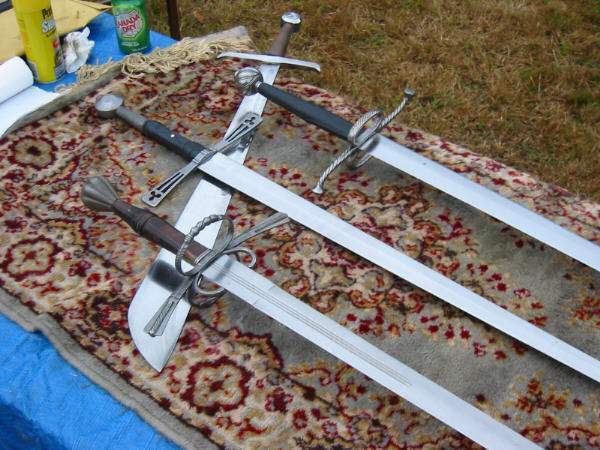 I found the two that I held felt a lot lighter than most arming swords. As for the cleaver type, I really don't have any first hand experience with one, but by putting so much mass in the final third it would definitely make it hit harder. Having the tip so broad would also mean that it would cut well all the way to the final inch of the blade. Despite this, they wouldn't seem heavy or slow by any means due to their being so thin. I can only imagine that they would cut very well against cloth armor. Hope that helps. The only falchion I ever admired is the famous Conyers Falchion. I have never seen that one properly replicated. In fact, it seems to be the only really famous sword of the High Middle Ages that no one has made-at least to my knowledge-a decent copy of. I wonder why not. I mean, smiths have made copies of flamberge zwei handers, really long messers, big Danish axes, all of which require a lot of metal and skill, it must be easier to forge the Conyers than a flamberge zwei hander. Just throwing it out there. I wasn't sure if the cleavers simply appeared heavier or were heavier, so it's great to get that cleared up. Of course the cusped falchions were, as a falchion, a more cutting oreintated sword, but does anyone know how well they could thrust? Would they pass as cut and thrust swords? I have searched around good and cheap Thorpe falchions, and have found a few options. But now I come to think of it I haven't seen as many Conyer falchions. I think that one looks quite a bit better than this so-called John Conyers Falchion by Depeeka, though neither one is an exact reproduction (and I don't think the Del Tin is intended to be) . Weirdly Depeeka put a clip point at the end of their "Conyers:"
Other than that I think what Guillame has said above is pretty accurate. Not necessarily. Extremely thin and wide blades can actually be very tricky to make - remember, this one tapers from 6mm thick at its base to only 1.2mm around the primary cutting section. The proportions are really quite impressive, not just aesthetically but also in terms of the skill it took to make the damn thing! Yes. Plenty of swords like that: hatchet-point sabres (1796LC, 1796HC), double-edged swords with rounded rather than pointy tips (various Katzbalger, khanda, Viking swords, Arab straight swords, and many more). Maybe machetes aren't machetes either. Consider a 24" Tramontina: 24" blade, 29" total, distal taper from 2.2mm to 1.9mm, 1lb 2oz. While not exact (longer grip, guard a bit thick, lacking in final distal) the offering years ago by Glen Parrell was a reasonable facsimile. This example languishes away somewhere after I had traded it away to someone. I'd argue that most were anti-peasant or anti-common soldier weapons. They certainly weren't going to be able to hack through significant armor given the actual thinness of their blades. The cleaver style seems to be the older or the two, and is therefore probably best suited for fighting very lightly armored to unarmored opponents prior to the mid-thirteenth century. The later clipped style was likely a reaction to mail becoming much more common and the development of plate; the falchion wielder still wasn't going to hack through that, but at least he could do some thrusting if he came up against a more armored foe. So, what were the advantages? - Better cutting for an earlier time: cleaver. - Good cutting but also the ability to thrust to respond to changes in armor: clipped. I might also say that from a blacksmith's point of view, I have read anecdotally that single edged blades are easier to forge and shape than double edged cruciform blades that require symmetry. Therefore, another advantage might be to their relative ease of construction, if this is true. This assumes that a bladesmith is skilled enough to regularly make such thin blades properly. It would be great to hear from some knowledgeable blade makers on this "point." Personally, I'd not consider them "Anti-peasant" or "anti common soldier" weapons. The majority of the surviving examples are , as other's have pointed out, very well made, high quality weapons. The owners of such weapons weren't all that concerned about fighting what they considered "peasants or commoners" . To them, their primary opponents were the knightly and noble classes. The peasants were the concern of other peasants. Nobles wouldn't have used, or owned weapons designed to kill peasants. To them, their primary opponents were the knightly and noble classes. The peasants were the concern of other peasants. Maybe these peasants were led by a knight for their manoeuvres. That could explain the scarce number of historical falchions compared to swords, or their lesser importance in illustrations. Or maybe some knights launched raids on some camps guarded by textile armored foot soldiers. Or maybe it was a weapon used by knights or soldiers guarding some cities, and that their actions were made against civilian guys without armor. We actually don't know at all about falchions. They could have been designed for anything. Some guys even say that they were probably "anti-horse" weapons. (the Conyers Falchion). I have never seen that one properly replicated. In fact, it seems to be the only really famous sword of the High Middle Ages that no one has made-at least to my knowledge-a decent copy of. I wonder why not. I've spent what's now approaching close to ten years studying single-edged arms, including falchions. Museums have been incredibly helpful - Norwich Castle were pretty much offering a watery tart to lob their s̶c̶i̶m̶i̶t̶a̶r̶ Thorpe Fachion at me over the phone before I'd even asked to do so, Delft, Brussels, Paris, Hamburg, Leeds, even the Met, who are so often rushed off their feet, have all been incredibly helpful in study access, (or the potential to study there for those which I cant afford to get to yet, like NYC.). Likewise, the staff in auction houses like Hermann-Historica, Galerie Fischer and Bonhams have all been incredibly generous in their time, and allowed me access to objects which would otherwise have been lost of private collections without any data being recorded. And that is an unprecedented level of access. No-one else, not even those curators at the Royal Armouries I know has managed to get that far. Getting that far was only managed through something like 6 years of doggedly heckling them for access, and "accidentally" commenting to some the new staff how bad it would make them look if the most famous surviving cleaver form falchion in the world were omitted from the authoritative book on the subject, and instead replaced with a statement about how inaccessible it was. And pictures? Oh no. Us mere mortal peons are not allowed to take photographs of their precious dragon-killing falchion. Photography has been deemed Naughty in Thine Sight, and so no-one is allowed. You can of course get photographs by buying the few photographs which the cathedral licences out.... But each one has a 3-figure pricetag I'm not willing to pay for the pitiful shortage of detail contained in them, when combined with the total lack of data on the actual object. I have seriously contemplated what it would take in the way of a team of people to cause a commotion in the cathedral to serve as a distraction to security, so that I could have the time needed to steal photography while no-one's watching. That's how absurd the situation is. I vaguely recall that Leo Todeschini made a repro on commission (from the family who owned it originally?) about 15 years ago, but was required to return all reference material after production. I think that's the closest anyone's got to a repro of it. I would love to be the one to get to make one that's absolutely right, but I honestly do not know what it'll take to finally drag Durham Cathedral kicking and screaming into the 20th century. I would take a completely contrary view there. The knightly classes were concerned with the chivalric ideals, and the concepts of ransom and capture were quite ubiquitous for much of the medieval period that falchions were in use. In many ways, the aim of chivalric combat was not to kill each other amongst the nobility, and a dead noble was a tragedy. But a thousand dead commoners? that was a statistic. And in that context, look at the early, broad type 1 falchion - an often high-quality weapon, which is optimised for the cut - something which armour excels in protecting against. Armour that the lower classes did not wear. The falchion is a weapon which is discriminate - it excels in the cut against textiles and unarmoured targets, but is quite deficient against the sort of armour worn by the higher social classes. Hmm thanks for the interesting take. That seems like a corrective, grim reality of the possible perspective.